From family friendly to adults only, Kamloops has got the market cornered on frightful amounts of fun to thrill and delight ghouls and goblins of all ages. Go on…enjoy giving yourself a good scare. Halloween is more than a day. It’s a lifestyle. After the turkey dinners and pumpkin spice lattes—it’s time for a jump to the left and a step to the right to “Rocky Horror Picture Show”, to costumed shenanigans, to gallivanting to trick or treating. There is nothing better than a rocking costume party. I’ve prided myself on some clever costumes in the past. You take on the persona of the character, make friendship connections with costumed strangers, bond with the person who also came as Stevie Nicks. I’ve enjoyed many pop culture costumes: Audrey Hepburn, Amy Winehouse, Courtney Love, Kate Middleton and Britney Spears. With just a hair straightener, a neck tie and striped socks on my arms, I was Avril Lavigne at the height of her “Sk8r Boy” phase. I once made a Nicole Richie costume out of a skeleton suit, a red bikini, large sunglasses and a white headband. I’ve been witches, fairies and hippies—and it’s always a highlight of the fall season. However, my personal favorite is as the Widow of the Headless Horseman for the Kamloops Heritage Railway’s Ghost Train. It’s a thrill to haunt a vintage train, and give the gift of the creepy crawlies and help others release guttural shrieks from the depths of their soul. So enter…if you dare, to a month of Halloween horror shows and other happenings. The Ghost Train departs from the Lorne Street station on October 20, 21, 27, 28. (The Creepy Clown Train will take place on Thursday, October 26th.) Expect all kinds of creepy imagery peppered throughout the ride, like the sinister Headless Horseman, riding alongside the train. The audience can sit back and take in some good old-fashioned Halloween horrors. Rosanne Nelson, Manager of the Heritage Railway, said, “this is not for the faint of heart--even if you’ve been on the Ghost Train before—you’ve never seen it like this”. Kamloops Heritage Railway’s friendliest family event—Trick or Treat Train—runs on Sunday, October 29. Call 250-374-2141 or refer to kamrail.com for ticket reservation information. The Lorne street office is open Monday to Friday 10:00am-5:00pm. Kick start the Halloween season with the Kamloops Witch Walk on Friday, October 13 at 6:30pm. Meet with other Witches, Warlocks, Sorcerers, Mages, Alchemists, Wise Women and Users of Magic, and walk from Red Beard Cafe to The Rockin&apos; Firkin. Check out the 12th Annual Pumpkins of Light Festival on Thursday, October 26 at 6:00- 8:30pm. Hosted by Open Door Group&apos;s Gardengate Horticulture Program, this free, family-friendly event promises to be a hoot! Meander through the garden and down a ghostly pathway illuminated by hundreds of Jack O&apos;Lanterns that have been carved by Kamloops locals. Refreshments are limited so don’t wait and get there late! The festival is located on 915 Southill Street. For more information, please contact Social Development (250) 828-9810. Pavilion Theatre is located at 1025 Lorne Street. Check out their Facebook page for more information or call 250-372-3216. 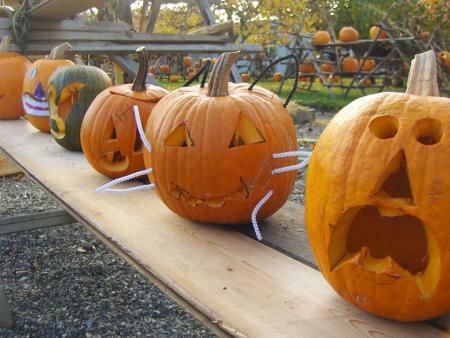 The Boo at the Zoo is going to make for a “spooktacular” Halloween at the BC Wildlife Park! The Park, home to over 40 wildlife species—is offering animal encounters, haunted maze, a spider scavenger hunt, a magic show with Uncle Chris the clown, and stories at the witches’ corner. Trick or treat in the park from October 27 to 29 from 5:00 to 9:00pm. Autumn in Kamloops wouldn’t be complete without a visit to Tranquille Farms. Explore its unique and haunting history through Tranquille Tunnel Theatre presented “The Witness” in partnership with Chimera Theatre. Thursday to Saturday until October 21st—performances are 7:00pm, 8:15pm and 9:30pm. Fancy a frightmare that shakes your core, pounds your heart and spikes your blood pressure? If so, go directly to Barn Haunt Vale—4938 Uplands Drive in Barnhartvale—which is running October 27 and 28 from 6:00 to 10:00pm. This exhibition takes over a month to setup, has 14 scare actors, 120 lit pumpkins carved, and a kid zone. Non-perishable food donations are welcomed to support the Kamloops Food Bank. Fireworks, Zombies, Experiments, Circuses, Parties & more! Kamloops Pride Monster Bash Halloween Dance at the DoubleTree by Hilton—October 21. Join Aberdeen Mall for an afternoon of trick or treat delight (over 30,000 pieces of candy up for grabs!) Please bring a non-perishable food bank donation to benefit the Kamloops Food Bank. The North Shore Business Improvement Association wants to make trick or treating fun, easy—and most of all—safe. The 5th Annual Treat Street starts on Tuesday, October 31 from 3:00-5:00pm. Wander along Tranquille Road to collect candy and check out the Brock Shopping Area for has some goodies for your little goblins and ghouls. Maps can be found online, also, refer to their Facebook page to check out the map.